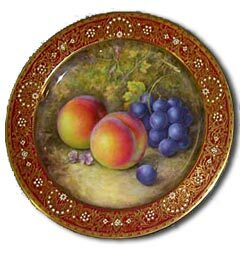 Royal Worcester fruit painted porcelain and the skill of the Worcester fruit artists. 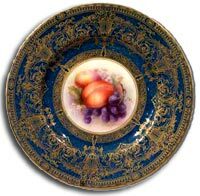 The beauty of Royal Worcester fruit painted porcelain can only be achieved thanks to the varied skills that the fruit painters and craftsmen possess. He painted a large plaque commissioned by a local farmer to celebrate the introduction of the pershore plum in 1880. Modern painters can train for up to seven years before being allowed to take their place with the great worcester artists of the past. The artist uses a palette of translucent colours and after the first layer of colour is applied the item is fired. Following this, further stages of painting and firing are carried out. At each stage the Worcester fruit painter will build up the strength of colour to give the fruit a real three dimensional quality. Translucent colours are used so that the lighter colours underneath will show through and give remarkable depth to the finished piece. And, of course a final inspection has to be made by a skilled craftsman who has the knowledge, experience and eye for the quality that Royal Worcester fruit customers expect in their finished product. 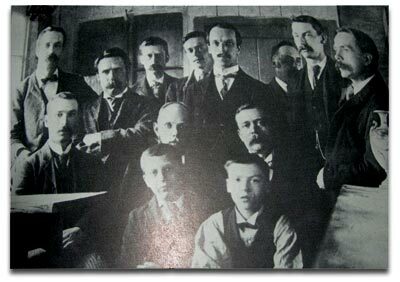 A Group of Royal Worcester fruit painters in 1899/1900. Left to right standing; Frank Roberts, Charles Baldwyn, George Johnson, Richard Sebright, C Greatbach, William Hawkins & Ricketts. Seated in Front; Left to right E Sadler, Robert Rea and Salter. The two apprentices in front are Harry Davis and Richardson. The Royal Worcester fruit painters. Throughout the history of Royal Worcester there have been many highly skilled artists but at no time was this more evident than with the talented and exciting group of painters assembled there in the 1920s. The likes of Reginald (Harry) Austin and his brother Walter Austin, Harry Ayrton and William Bagnall, John Freeman and Thomas Lockyer, George Moseley, William Bee, Horace Price, William Ricketts and the superb Richard Sebright, together with Shuck, Townsend and Twilton, provided the Royal Worcester fruits department with a pool of extraordinary talent. All that talent was place under the foremanship of the renowned William Hawkins, and has not been matched at any other time or by any other porcelain works since. For Royal Worcester the 1920s started with a bang and with post WWI euphoria running riot, but hard times were to follow swiftly on its heals and many of their fine painters were forced into finding alternative incomes or alternative employment. Born in 1890 Reginald Austin, better known as Harry, studied art at Worcester college. He specialised in fruit painting, along with flowers and birds, the latter becoming his best known subjects. He remained at Royal Worcester throughout the 1920s supplementing his income by selling watercolours locally but left in 1930 during the height of the depression to do freelance work where he could earn more money. Walter Austin was Harry Austins younger brother and was one year younger. Like Harry he won several medals for his drawings of plants including the Kings Prize and these were to be his major area of excellence. He was however a fine fruit painter and produced many pieces during his stay at Royal Worcester. Like his brother he produced many watercolours as a side line to boost his earnings during the difficult times and finally left the Royal Worcester factory in 1930. He worked for some years as a painter of flowers on furniture, a very popular fashion at the time. Harry Ayrton, or Tim, was born in 1905 and started at the Royal Worcester factory in 1920 where he stayed until his retirement in 1970. He continued to paint there part time, until his death in 1976. He was a member of the group of apprentices that became known as the ‘Terrible Seven’ who, in the most playful and harmless of manner, would terrorise the other Royal Worcester workers and skive off to play football whenever the opportunity arose. He was also a very keen member of the works cycling club and participated in many of their works outings and races. Although trained to paint many different subjects Harry was most skilful at fruit painting and this was his major topic throughout the 1920s. William Bagnall was another of the Terrible Seven apprentices. He started at Royal Worcester in 1918 and became a fine fruit painter and a master of still life. William Bagnall didn’t fair as well as some of the others during the hard times of the 1920’s and although he stayed at the Royal Worcester factory throughout, he left in the early 30s to take over a fish and chip shop in Guildford. Yet another of the Terrible Seven, William Bee was a great fruit painter whose talents were wasted by the severe depression that swept the world. He left in 1932 and nothing significant is known about his later life. Kitty Blake worked at the Royal Worcester factory for 48 years from 1905 until 1953. She specialized in flowers and small fruits. She also created several designs featuring blackberries and buttercups. She had previously spent time at James Hadleys factory in Diglis road and her Hadley style rendering of bunches of blackberries, have become the Kitty Blake signature pieces, much sought after by collectors and mouth-wateringly real. She was seen as a team player with a good sense of humour and Kitty Blake became very popular at the Royal Worcester factory. She was considered to be a bit of a live wire in her younger days and were the male painters of the time, had their terrible seven apprentices, then the female painters had their Saucy Six who would terrorise any male staff that upset them. Kitty Blake was a leading light in this group and they made their presence felt both inside and outside the Worcester factory. Kitty Blake was a driving force at the factory throughout her long stay. Times were hard for much of it and she would spend her spare time making advertising posters for events held at the Royal Worcester works. She is said to have had that common touch and was never been seen without her red lipstick and cigarette. John Freeman was born in 1911 and joined the Royal Worcester factory in 1925 just as the major problems started. He became an extremely talented fruit and still life’s painter and was probably the most prolific of all the fruit painters of his time. He stayed at the Royal Worcester factory throughout his long working life and became the senior fruit painter in the mens painting room. John Freeman was known among his colleagues as ‘The Fruit Machine’, due to the speed of his output. 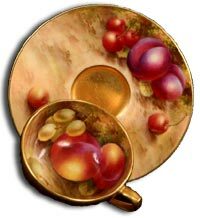 Thomas Lockyer worked at the Royal Worcester factory from just before the first World War as a specialist fruit painter. 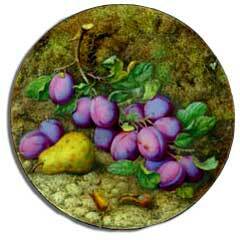 He had his own style of painting dessert fruits against a mossy background that was mouth-wateringly real. He left the factory temporarily to serve in the armed forces during the first world war and returned in 1918, wounded in the leg and with a permanent limp. 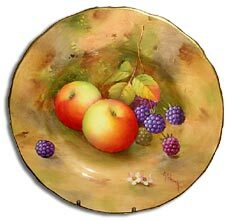 He stayed at the Royal Worcester factory, producing his stunning fruit paintings until his death in 1935. George Moseley was another of the Terrible Seven apprentices. He started in 1919 and became an adept, if slightly less well known, painter of fruit and small birds. He stayed at the Royal Worcester factory until 1935, when he left to join the Army. Born in 1898 Horace Price started work at the Royal Worcester factory in 1912 and stayed there throughout his working life. He was a keen and well respected fruit painter that could also turn his hand to flowers in both the general Royal Worcester and the Hadley styles. He served in the first world war where he lost a finger on his right hand but this made no difference to his life or his work and he was greatly admired by the factory management. Horace Price later became foreman of all the apprentice painters. William Ricketts worked at the Royal Worcester factory from around 1877 until the early 1930s. He was a skilled painter of flowers but was best known for his fruit painting. He would usually paint this as a composition including a vase or other ornament and developed his own style using oils that broke up the paints to provide a unique mottled background to his work. William Ricketts was also a skilled water colourist and produced many still life’s in this medium. He is, perhaps, one of the most highly regarded of the Royal Worcester fruit painters. 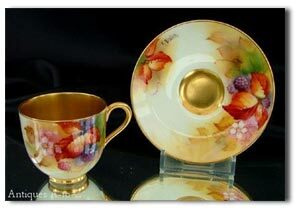 Frank Roberts was born in 1857 and started work at the Royal worcester factory in 1872. He was an exceptional painter of fruit in the traditional worcester style but was also noted for his superb renditions of flowers (particulary orchids) and would sometimes produce raised gold work. He was a man noted for being very insular and with strong religious convictions. In later days, many of his pieces were used in the training of new apprentices. Frank stayed with the Royal Worcester factory until just before he died in 1920.
to make what you might call a decent living at it. Painters were paid piecemeal, ie. the more they produced the more they earned, but Richard Sebright was so painstaking in his work, so determined that each piece he did would be the best that he could produce, that he was never able to work fast enough to earn as much as many of the others did. 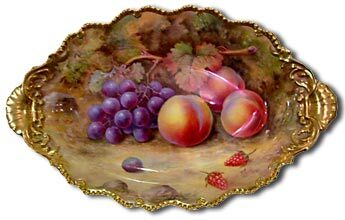 Born in 1880 Albert Shuck painted fruit and flowers at Royal Worcester throughout the 1920s. He was regarded as a very shy and reserved man and his workmates knew very little about him. Another of the Terrible Seven, Edward Townsend, or Ted, started at the Royal Worcester factory in 1918 and stayed there until he retired in 1971. He loved painting fruit but was also skilled in many other areas. He became assistant foreman to Harry Davis and then became foreman in 1954 when Davis retired. Yet another of the Terrible Seven, Charlie Twilton started as an apprentice at Royal Worcester in 1918 but although he was a fine fruit painter he was always much too slow and was unable to survive by painting during the depression. He left in the late 20s or early 30s to follow some other occupation. William Hawkins was the foreman of the mens painting room throughout most of the 1920s until his retirement in 1928. His real love and his best work was in portrait and figural subjects. The Royal Worcester fruit painting technique. 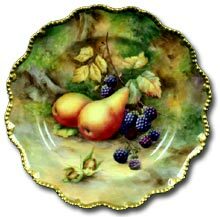 Painting Worcester fruit has developed over two centuries at the Royal Worcester factory, and only the finest and most decorative shapes are reserved for this decoration. Each Worcester fruit composition is a unique work of art. In the eighteenth century fruit was usually depicted against a white background. 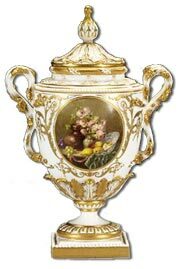 But, by the mid-nineteenth century, the present style was evolving and has been highly sought after by Royal Worcester connoisseurs and collectors worldwide. The artist uses a palette of translucent colours to create depth of colour giving the fruit a real three dimensional quality. The gilder meticulously applies 22 carat gold by hand, adding to the richness and slendour of each finished piece. A variety of tools and special techniques allow the burnisher to transform the gold to its characteristic high sheen.